Today I’m going to talk about capitalising the State Pension. We’ll be looking at the various methods we can use to convert my future pension payments into a present-day lump sum. Most people don’t do this, and plenty of investors would argue that you shouldn’t, but I’ve got a good reason. It isn’t because it will make my bottom line bigger (though that’s always welcome) but rather it’s so that my asset allocation analysis will be accurate. One of my themes for 2018 will be looking at ways to protect my portfolio, since I expect a market crash either next year or the year after. This is likely to involve adjusting my asset allocation, so I want to be confident that I’m starting from the right place. I use similar logic to defend my decision to include property in my portfolio valuations. My State Pension is like an annuity or a bond allocation, and will form part of the “Safe Already” portion of my portfolio. Technically, I should have done this earlier in the year, when I got within 10 years of my State Pension being paid. The government has a policy that people will get 10 years notice of changes to the State Pension Age (SPA). The government has introduced a regular and structured method for considering future changes in the State Pension age. The first review took place earlier this year. Subsequent reviews will take place every Parliament with each report published within 6 years of its predecessor. Any future changes to State Pension age will, as now, require primary legislation and will be subject to the full scrutiny of Parliament. The review will seek to give individuals affected by changes to their State Pension age at least 10 years’ notice. Since my start date is 1st April 2027, I’m now within the 10 year cut-off. Which means that my State Pension is fairly secure. I didn’t realise until recently that my pension wouldn’t start on my 66th birthday (in October 2026) but six months later instead. It seems that my SPA is not 66, but 66½. I looked at my State Pension entitlement back in February this year. My entitlement was £135.13 per week, or £7K per year. Despite 40 years of contributions, a combination of contracting out and partial years means that I needed another five years of contributions to get the full £155.65 a week (£8K per year). Since then I’ve made another year of contributions. I don’t draw a large-enough salary any more, so the remaining four years of contributions will need to be voluntary. I can pay these up to six years in arrears, though if I pay within two years I get to pay at the rate which originally applied to that year. So I need to start paying by April 2020. My new forecast is £159.55 a week, or £8.3K per year – the triple-lock has worked its magic. But of course, that assumes that I make up the missing four years of contributions. They’ve made this much clearer on the website since my last visit. My current pension entitlement is £143.08 a week, or £7,461 a year. Discount the annual payments, up to my life expectancy (a sort of cash basis). Yield basis – how much would I need to hold in bonds to generate that income. The same, but with the FTSE All-Share rather than bonds. A similar approach, but using the Safe Withdrawal Rate as the measuring stick. As an annuity, with the 10-year Gilt yield as the discount rate. 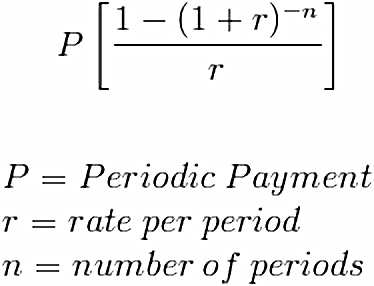 As a reverse annuity, using the current annuity rate as a discount rate. Using the Government’s “20 times” rule for DB pensions. Some of these were used in my earlier post on the State Pension – when I tried to work out whether voluntary NICs were good value. We’ll take advantage of the fact that pensions are index-linked to ignore inflation, and in each case value the pension in 2017 pounds. Let’s see what numbers the various methods bring up. 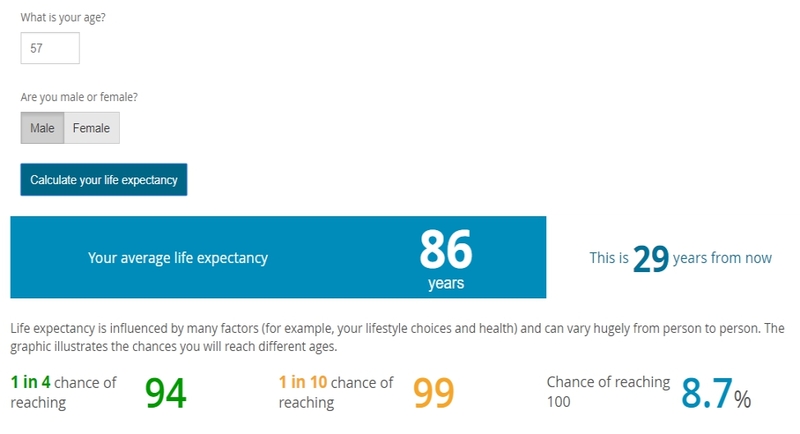 At age 57, my life expectancy here in the UK is 81, which gives me 24 more years of life. But only 14½ years of pension. The 10-year Gilt yield is 1.256% as I write, so that is my discount rate. It turns out that I should receive £115,646 (in 2017 pounds) as my State Pension. And the present value of those payments is £94K. Using the bond yield of 1.256%, I would need a portfolio of £594K to produce a steady income of £7,461 a year. But I don’t need that pot until 9½ years from now, so we can shrink it by the relevant conversion factor 89.4%. That gives a pot size of £531K. Record low bond yields (and interest rates) mean that the results here are unusual, and I will ignore them. The yield on the FTSE All-Share was 3.61% at the end of June (the latest date I could find). That means that I would need £207K in the stock market to produce an annual income of £7,461. After discounting that drops to £185K. The traditional safe withdrawal rate is 4% pa, which would mean I needed a pot of £187K. But I think that rate is optimistic for the UK in 2017, so I prefer a rate of 3.33% (1/30). That gives me a pot size of £226K, or after discounting, £202K. Annuity calculators are easy to find online, but I couldn’t find one that accepted partial years. So I did the calculation for 14 years and 15 years and averaged the answers. The value as an annuity was £98K, which discounted back to £88K. 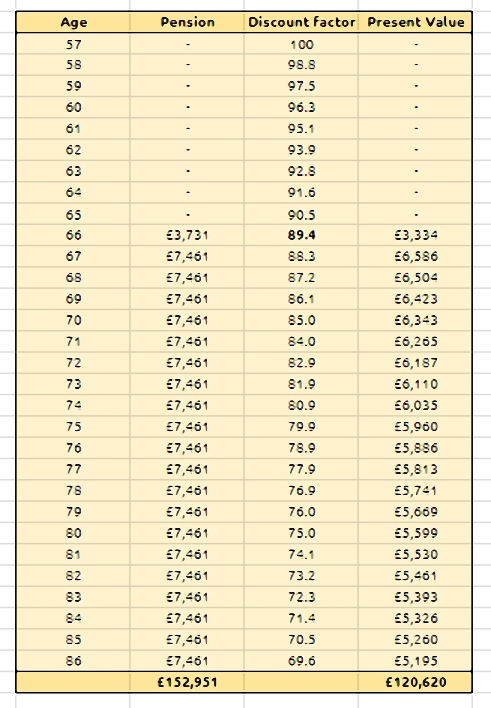 The current level for an annuity at age 65 with index-linking is the nearest match that I can find for the State Pension. This currently pays £3,316 pa for an initial purchase price of £100K. So we can use 3.32% as our discount rate. This gives us a pot size of £225K, or £201K after discounting. This is the rule used by the Government to value DB pensions as part of the test of whether your lifetime allowance (LTA) has been used up. It’s very favourable to DB pensions, since as we have seen, yield factors would give a value of 33 times or even higher. You just multiply the annual income by 20, which gives us £149K. We have seven numbers, but I’m going to ignore the highest (derived from bond yields), which is due to the current historic lows in interest rates. I really should therefore ignore the lowest as well, but I prefer to err on the side of caution. A simple average of these five gives a present value for my State Pension of £152,857. The day after I published this post, I discovered that the ONS had released a life expectancy calculator. The good news is that my projected life expectancy is 86, not 81. The bad news is this means that the previous calculations were incorrect. Or some of them, at least. Of the six values we averaged, four were based either on discounting numbers from my State Pension Age (66½), or using the Public Sector LTA multiplier. Neither of these (pension age or multiplier) have changed. The discounted payments method needs to be revisited, since we have five extra years of payments to discount. The old value was £93,984, the new value is £120,620. 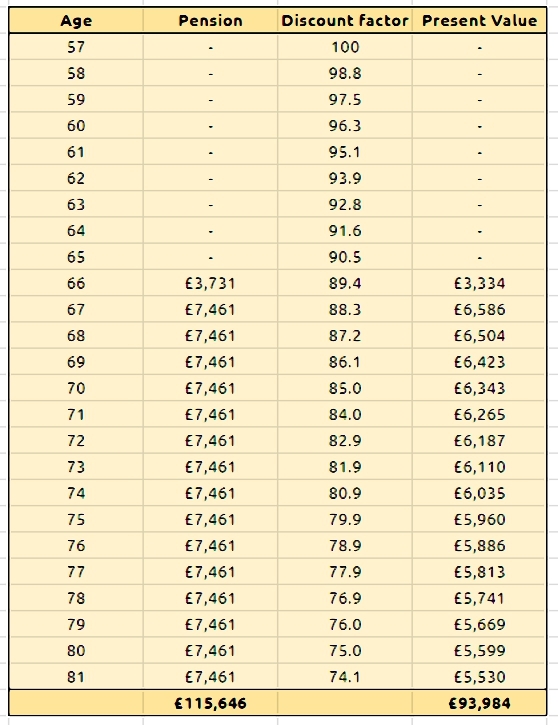 The other change is the annuity calculation, which rises from £87,885 to £114,644. So the revised present value for my capitalised State Pension – the average of the six underlying figures – is £161,756. I’ll use this in this year’s Annual Portfolio review, and update it for next year’s review – in December 2018. I don’t understand it all, but maybe some of the calculations assume that the capital is not drawn down, but will remain intact. If that’s the case that is not comparable with the state pension making it look more valuable than it is. Also perhaps assuming that the end of retirement is at the end of the average life expectancy under-estimates the value of the insurance component of the state pension, that lasts however long life is, making it look less valuable than it is. Perhaps to maximize the similarity it should be assumed in every case where there is a pension fund that it both grows and is drawn down so that at the age of 86 it is exhausted, plus the cost today of a lifetime annuity from age 86 to cover the risk of living longer than 86. I’m not sure that I understand your comment. I don’t think that any of the methods give the right answer, or even that the average of six of them is the right answer. But I’d rather have the best answer that I can understand and explain, than no answer at all. 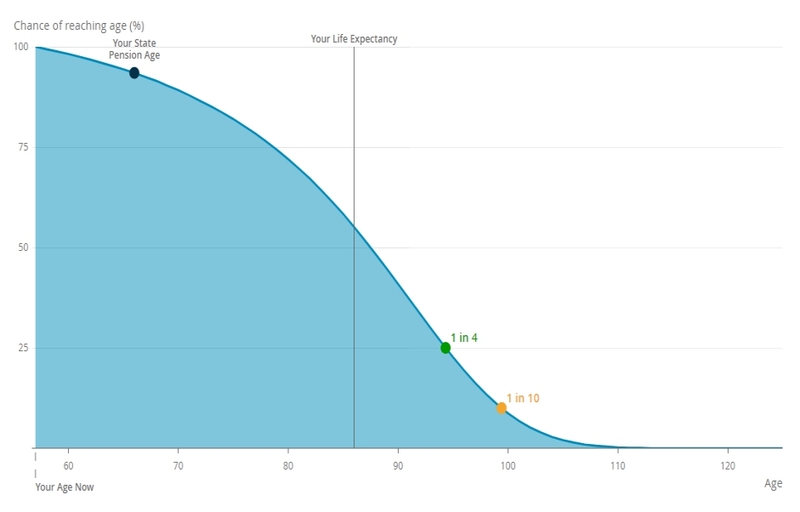 The insurance component could be undervalued, but by using my average life expectancy, it’s just as likely to be over-valued. The terminal value (or otherwise) of the pension is also a bit of a red herring for me, as I’ll be dead at that point, and I have no children to pass on an inheritance to. For me this is primarily an asset allocation issue. I want to work out what proportion of my net worth is allocated to insured income (DB pensions). If I underestimate this, I am likely to under-allocate to riskier assets (equities).